A Mom’s First Hand Guide to keeping your sanity through the Rainbow Loom craze! 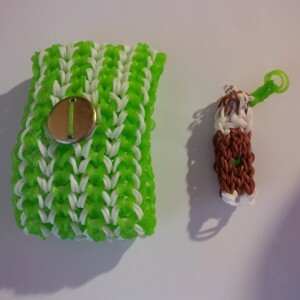 When I first heard of rainbow looming I figured it would be a short lived fad. I didn’t see how it could be worth spending so much on a passing fancy. Well, it’s been months and while it’s not as red hot as it once was, it’s still a big hit in our house and I get a lot of questions from other parents about it – so here are my tips learned first hand! 1 – Don’t cheap out! We started with a dollar store version….big mistake. The three of us couldn’t figure out how to use it, the quality was terrible, the instructions almost non-existant and the bands kept snapping. If your kid is really wanting to Rainbow Loom spend the $15 and get the good one. For harder projects you can actually connect the looms together, so it’s well worth it. Same goes for the elastics – the cheaper ones snap more easily. Imagine spending an hour (or 4) on a project only to have one band snap and the whole thing is done. 2 – For your own sanity, buy a book and an organizer. Call it a gift, make them use their own money or do chores…but just buy them 🙂 You can try to MacGyver a dollar store case – but the one shown is made for rainbow looms – fits the loom, the hooks, the millions of elastics that would otherwise end up everywhere…and as for the book, yes you can see the videos on youtube for harder projects. But if you don’t want your kid glued to the screen non-stop or hogging your tablet or phone (or using precious internet if you’re on holidays) pick up a book. 3 – Remember that this is a learned skill. Expect some tantrums…and some from the kids too! 😉 It’s not easy to do, so encourage the kids to start at the front of the book and work their way up. And if you don’t believe it’s hard, sit down and try to make one. I can do a lot of the basics, but once they start using fancy terms and it gets too complicated I start to sweat. It’s a great life lesson for the kids – not every project will turn out. Some will take hours to make – patience is the key for everyone. Once you master it though, the sky is the limit. The kiddo now makes an insane variety of objects…in the picture is a water bottle sleeve she made for her dad, even added a button to fancy it up. Beside it is a mother’s day gift she made me – came in my room early in the morning asking what my favourite animal was. I was not awake enough to come up with one so she moved onto what my favourite thing was – obvious reply is coffee at 6am. It’s hard to tell from the picture, but that is a Starbucks Frappuccino on the right – with whipped cream on top, a straw and even some green in the middle for their logo. I’m not saying these projects will be useful at all – but the kids will have fun making them, and people will have fun receiving them…for a while. 4 – Pick up some extras – once you get tired of wearing six thousand bracelets, pick up some keychain rings at Micheals. My daughter has made all kinds of keychains for every single member of our family – almost any project can be turned into a keychain too. And once they master the easy stuff, spend the $2 at Walmart or Micheals and buy a crochet hook – it’s metal and makes it a lot harder. We’ve snapped 2 of the plastic hooks – some projects have several elastics all bunched up and it bends the hook too far. Another tip – stick to bags of one color of elastics. Sure, the assorted packs seem fun at first until you spend hours sorting them as a family. But keeping that case organized has kept our house pretty elastic free – and it’s always ready to go. 5 – Give the kids a quiet area to work in – preferably far away from you! 🙂 When mine got to the point of trying harder projects we had to tiptoe around, my husband learned quickly that interrupting to chitchat in the middle of something complicated is not recommended. If they watch a lot of the videos on youtube, give them some headphones – nice for everyone! 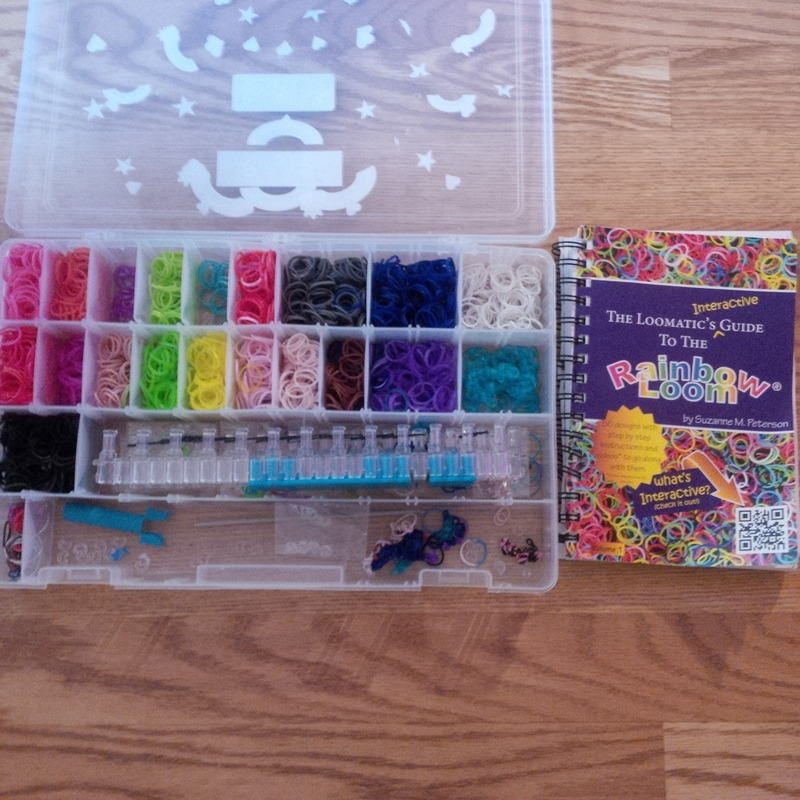 I was not a Rainbow Loom believer at the start…I’ve totally been converted. We went on holidays and my daughter spent 2 weeks with no internet – and no desire to watch tv or once complain about the lack of internet. She rainbow loomed gigantic flowers for her cousin, made every single person a bracelet or a keychain. We visited many craft stores and picked up beads to incorporate into the bracelets. It’s taught her to keep herself busy, to start a project and follow through and the joy of accomplishing a super hard project just can’t be beat. I love hearing the crazy Rainbow Loom breakdowns and meltdowns – and of course how they overcame it so comment with your best ones! And if you have any extra tips to share go for it! Also if you haven’t given into the Rainbow Loom madness I’d love to hear your side of it too! « Shoppers Drugmart Bonus points day coupon! I love this. While I am happy that my oldest is a little young, these are great (and funny) tips. Thanks for taking the time to put this together. Where did you get the loom case? Our Micheals didn’t have that one and I am living with a million ziplock backs of elastics in my house! Contemplating picking up a cheap Fishing Tackle container but something that holds the loom would be ideal! We ordered it from Chapters. If you’re back in Winnipeg they have it at Kite and Kaboodle at the Forks too – huge selection of elastics there too. What age do you think is best for learning this? I think 5 at least to start, with a lot of help. Mine is 8 and doesn’t need help anymore, didn’t take too long to get the hang of it at that age. Thanks for the info and tips Nadine! Our daughter just got a Rainbow Loom for her birthday a couple of weeks ago. Can you recommend a book or books? We use the Loomatics interactive guide, it’s the one shown in the picture. Super easy for kids to follow right away, they have it at Chapters and also Kite and Kaboodle had it too. The book also has that code at the bottom of the pages, so you can scan and go online if you have any problems – great option. Good variety of projects too.